On Saturday, August 12th, 2017, Joe Ferraro, of RI won the New England Dragway Motorcycle Masters contest on his first try. Considering he was in competition against the best of the best at New England Dragway, that’s quite an accomplishment. Some track champions like Ed Hughes and John Civitarese, who were among the fallen, have been in Masters competition for 5 years now and have yet to win the event. Anytime a motorcycle drag racer can be up against the likes of Sam Hurwitz and Tony Ficher and come away with a win, that’s a win well earned. 2016 Masters Racers: L-R John Civitarese, Tyler Wilkerson, Ed Hughes, Sam Hurwitz, Joe Ferraro, Carl Cicchetto, Tony Ficher. Tom McCarthy photo. And while most people don’t know it, Joe is an amputee, missing one foot. He was in a bad bike crash in 2007, was hit by a drunk-driver, and lost a portion of his lower left leg. 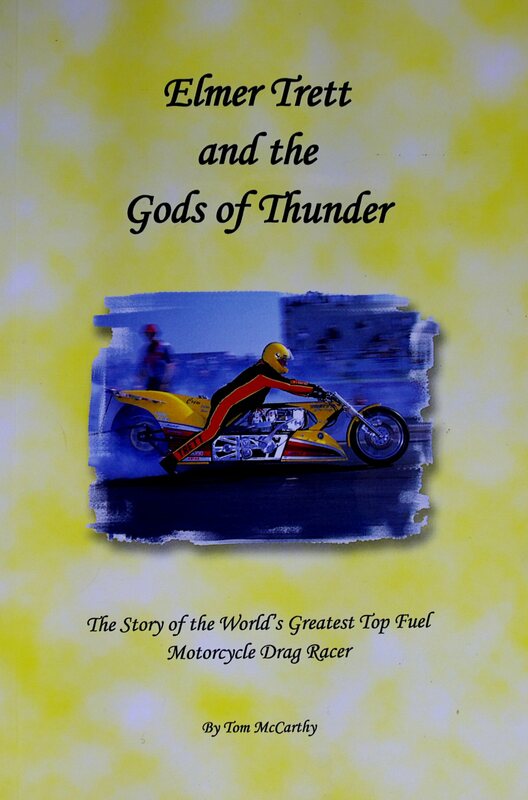 Yet his love of motorcycles and racing helps to sustain him and he’s been motorcycle drag racing since 2008. 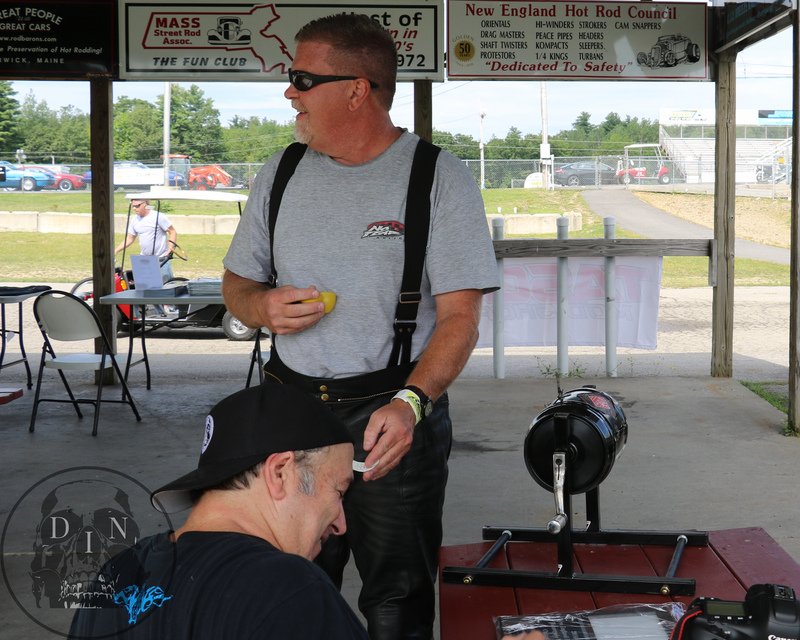 He’s a tough one for sure and he won a tough race: The New England Dragway Motorcycle Masters event. 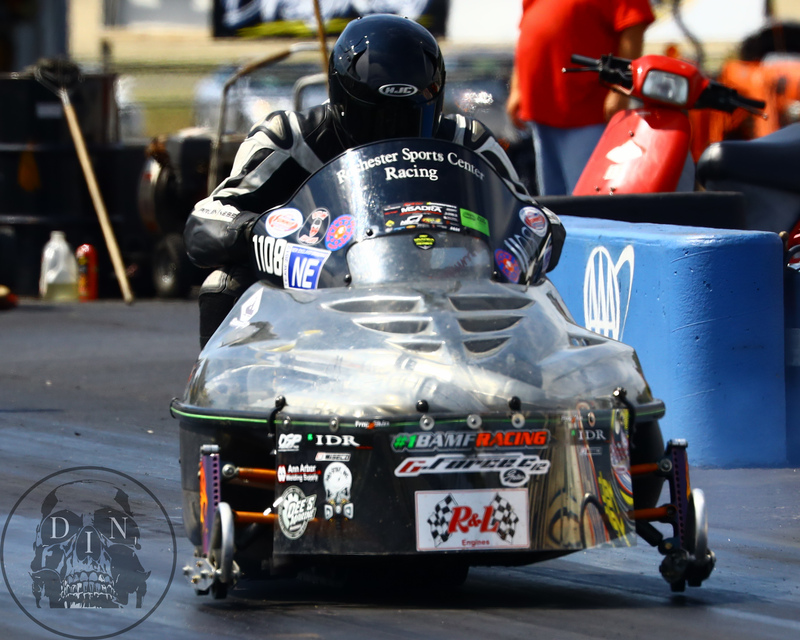 To be invited into M/C Masters competition, which is exclusive to New England Dragway motorcycle and sled racers, a competitor must first be either a points class winner or runner up. And where an eight bike competition ladder is used, the open slots are filled by votes from the racers themselves. Just being in Masters competition alone is a feat in itself. 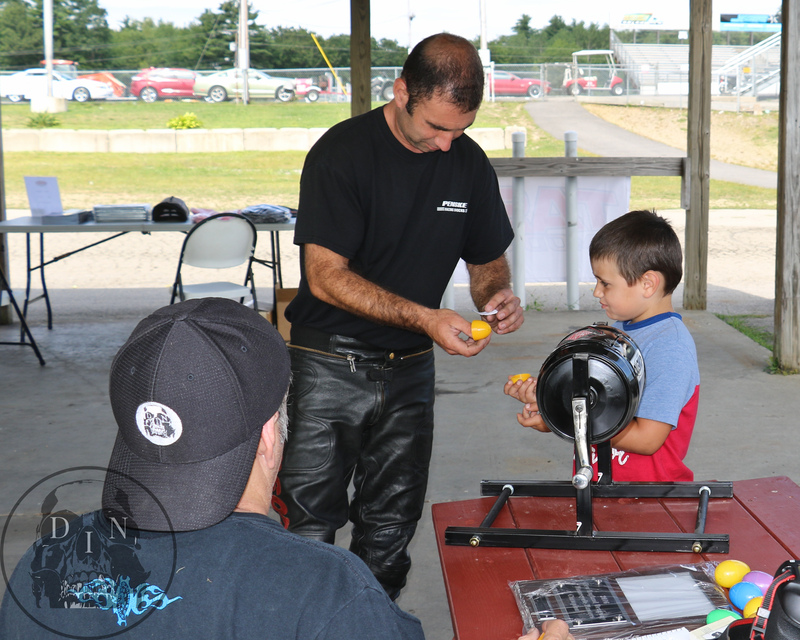 There are no entry fees, the racers are honored guests of New England Dragway for the day. Hard Launch by Carl Cicchetto on his drag sled at New England Dragway during the annual New England Dragway Motorcycle Masters competition. Tom McCarthy photo. No money is involved; the race is about honor and dignity, racing for the love of racing itself – to race against the best of the best, just to see whose best. Tony Ficher gets a little help from his son is choosing a name during the Masters selection process. Tony was runner-up in year one of the Master race and he made it to the Semi-Finals this year. Pat Sullivan photo. When the best of the 2016 NED racers squared off on August 12th, 2017 the field looked like this: Joe Ferraro drew Sam Hurwitz in round one as the first pair out. Tyler Wilkerson had a bye run as his opponent could not show. Ed Hughes drew John Civitarese for the second consecutive time in two years, the best of friends going head-to-head once again. And Carl Cicchetto drew Tony Ficher for the opening round. Top Bike racer Ed Hughes for the second year in a row chooses his best buddy “Civi” for round one competition by luck of the draw. Ed has dropped two in a row to Civi in two years. Tom McCarthy photo. Joe Ferraro cut and .058 light to Sam’s .157 RT and ran 8.38 on his 8.30 dial to take out Sam Hurwitz first. John Civitarese, also known as “Civi” cut a good light on Ed Hughes but he didn’t need it as Ed lit the red-eye and fouled out. Carl Cicchetto had an uncharacteristic .100 RT against Tony Ficher who responded with a .032 reaction time and at the stripe, Tony ended Carl’s day early. In round two, Joe defeated Tyler Wilkerson with a quicker reaction time (.056) to Tyler’s (.078), and then ran 8.34 on his 8.30 dial-in, as Tyler managed a 9.39 on his 9.36 dial. This sent Joe to the final round against Civi. John Civitarese in his semi-final match up defeated Tony Ficher by a mere.006 of a second! They had a great drag race indeed! 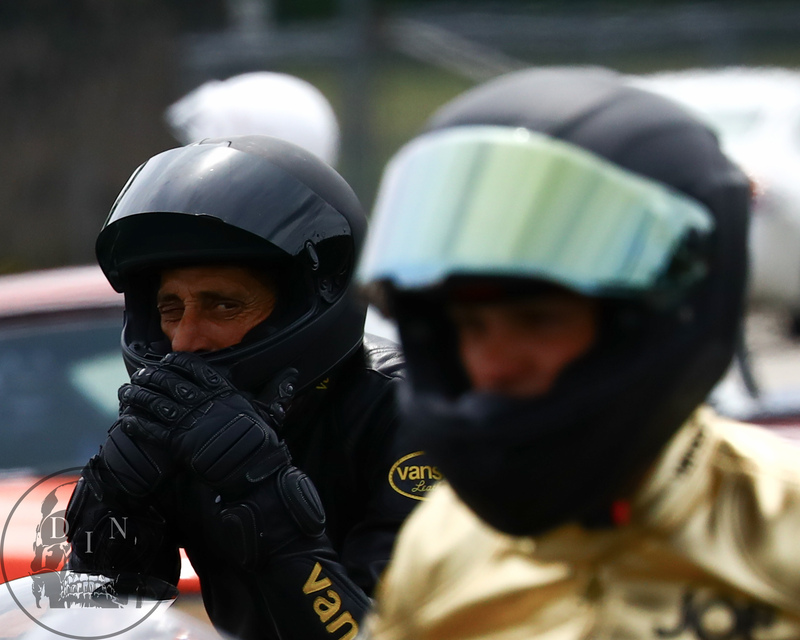 John “Civi” Civitarese gives Joe Ferraro the eye, just before their final round match up in the Masters race. Civi has been the R/U for two years in a row now. Tom McCarthy photo. In the final round, Civi had the better reaction to the tree by far, as Joe spun the tire badly in first gear. Civi had Joe by a bunch, but John broke out on the big end, and that sent Joe Ferraro to the winners circle in his first ever Masters competition. 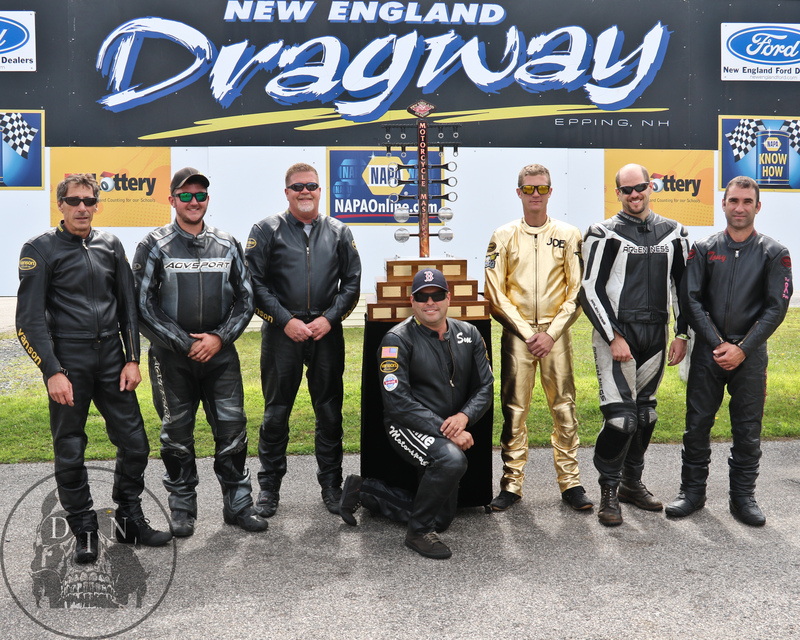 Joe Ferraro is greeted in the New England Dragway winner’s circle by Chris Pratt of Just Wood Flooring, Newfields NH, to receive his plaque for winning the 5th annual New England Dragway Motorcycle Masters race. 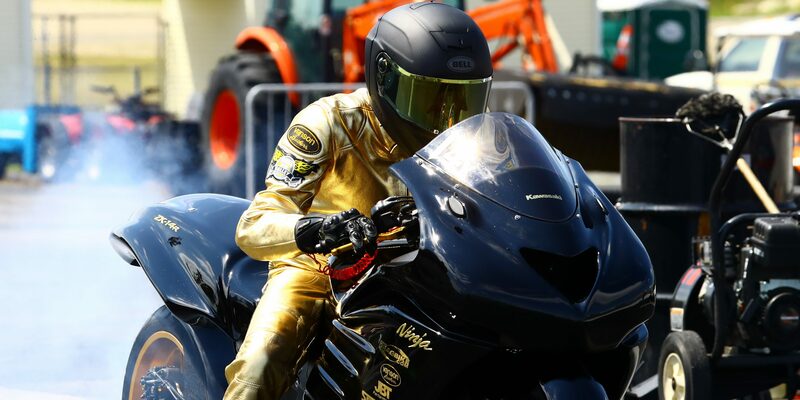 Joe’s name will be engraved into the Motorcycle Masters trophy as he now ranks among the best of the best at New England Dragway, in Epping, NH. Tom McCarthy photo. 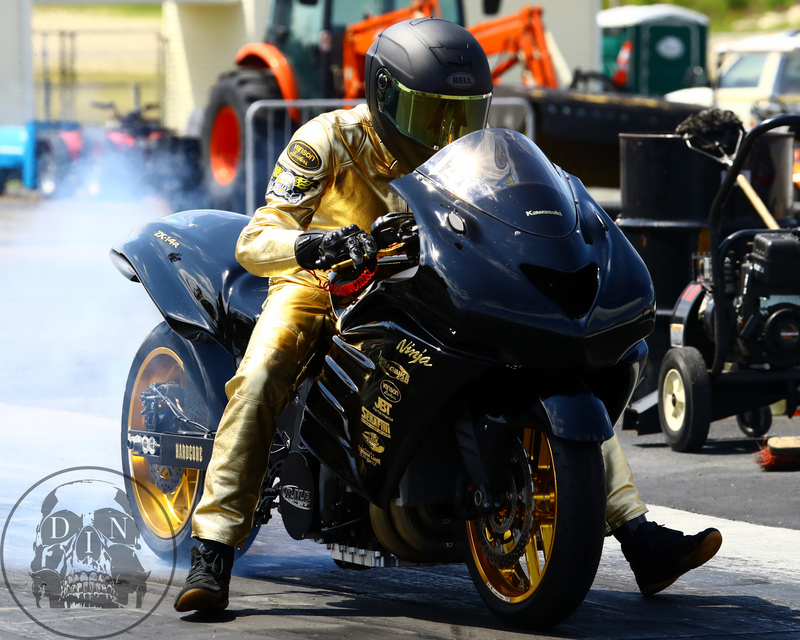 Joe Ferraro of RI, smoked the competition on his way to winning in the Motorcycle Masters race at New England Dragway. Tom McCarthy photo. Joe not only got by round one, he won it all and now his name will join the best motorcycle/sled racers at New England Dragway as he get’s his name engraved on the New England Dragway Motorcycle Masters trophy, one of 48 names to adorn the trophy that is the Stanly Cup of motorcycle drag racing. All 7 foot, 75 pounds of it, made from broken drag bike components, donated by New England motorcycle drag racers. Joe will receive a plaque for his wall at home, donated by Chris Pratt and his Just Wood Flooring in Newfields, NH, to commemorate his win. Just Wood Flooring has donated $50 to this plaque for five years in a row now and the racers give a big thank you to Mr. Pratt for his support of the sport we all love – motorcycle drag racing. Big thanks to Tom McCarthy for putting this great program together for his local track. This is what the sport needs. The IDBL is awarding Joe Ferraro a free Pro ET tech card in October for his big win at the Masters. The IDBL invites all New England Dargway racers to the DME Fall Nationals Oct. 6-8 at Maryland International Raceway. 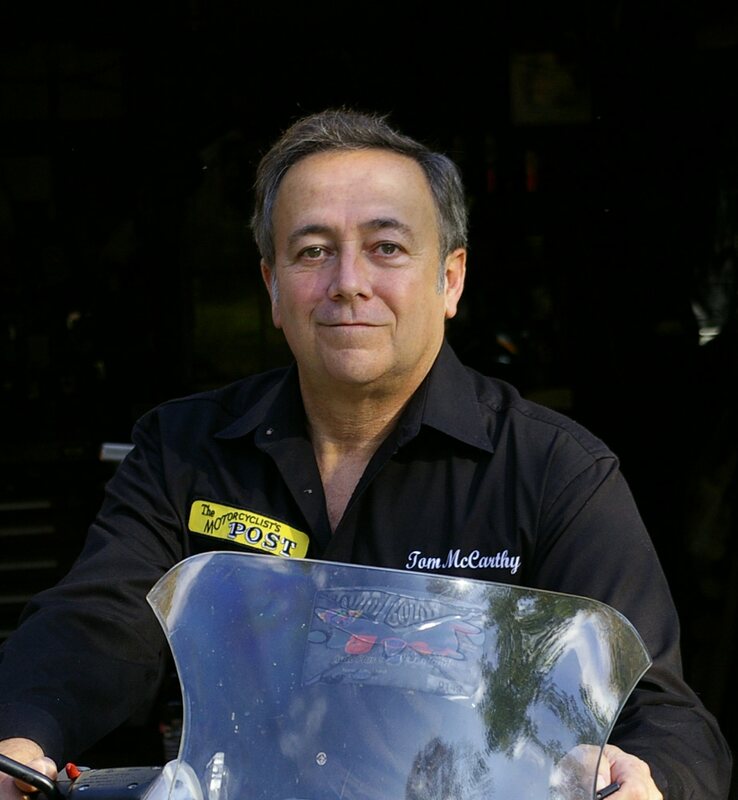 Tom McCarthy bio – Click here to read McCarthy’s biography.